"Donate today to help us purchase equipment that will make a difference for the next 10 years"
We are planning to replace a 10 year old ambulance in 2019 that is now past it useful life and has become too expensive to maintain. Help us purchase this ambulance and know that your donation will be making a difference and saving lives for the next 10 years! 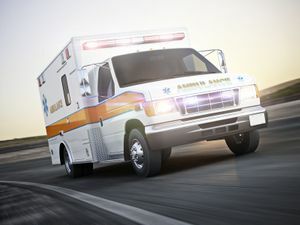 One of the most dangerous parts of any EMS call is transporting the patient. The patient is at risk when they are being lifted and our volunteers are at risk of serious injury. Repetitive motions such as lifting, lowering, carrying, and bending put significant spinal strain on our volunteers. The purchase of new Stryker Power-PRO XT stretchers for our ambulances will reduce the risk of injury to both the patient and our volunteers. Anyone who has ever taken a CPR class knows that the last thing you want to do is stop. You are trained to continue CPR until exhaustion or someone else takes over. In Hoboken, we have another problem with the large amount of walk up apartments its impossible to both continue CPR and get the patient to the ambulance. As a result, CPR can be interrupted while moving the patient. We would like to solve this issue with the Zoll AutoPulse devices. The AutoPulse device can perform automatic perfect CPR and never gets exhausted. The device can contine providing CPR down steep stairwells, around corners or even in cramped elevator. Compared with manual CPR, the AutoPulse has been shown to reduce interruptions in compressions during transport by more than 85.6%. Studies have demonstrated improved vial signs because the AutoPulse drives superior blood flow. For more information see the video below and visit the Zoll website by clicking here.